Firstly is the ICE patch… a simple, but clever idea, and one of those things you hope you’ll never need. 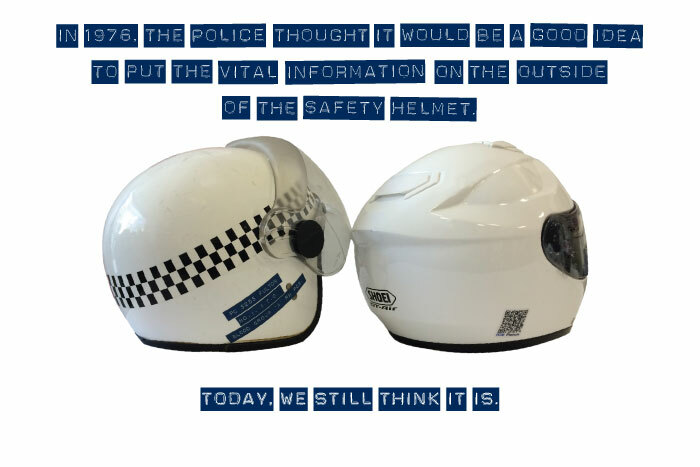 It’s a set of stickers you can apply to your crash helmet that give the Emergency Services access to your vital info by scanning a Quick Response code. 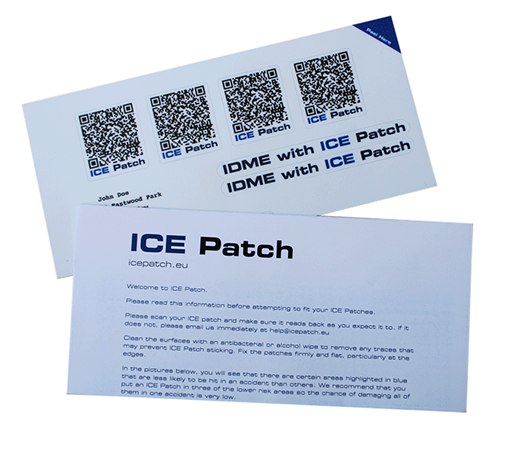 ICE Patch QR Codes to make it easier and faster for the emergency services to access your vital information. There’s no need to search your person for a medic alert bracelet. Your health and contact information is at their fingertips. It’s inexpensive and impossible to leave at home. The emergency services can immediately establish who you are, who to call and access any medical information that could help to save your life. They know it’s accurate and current, because you gave it to them. Some Police Motorcycle Units are now wearing ICE Patches themselves. For instance, the Essex Police motorcyclists seen on Channel 5’s Emergency Bikers are seen to sport ICE Patch QR codes on their helmets. A set of four identical ICE Patches costs £10 plus applicable sales tax and postage. 10% of all of our revenues are donated to road safety and rescue charities and initiatives. Only available here. A lot of Lambretta riders and scooterists in general are of more mature years these days… and I like to think most of us know how to ride safely and defensively. But I’m sure we’ve all encoutered car drivers who don’t seem to have a clue, about anyone on two wheels. Young Car Driver is a resource for learner car drivers and younger motorists that has a section on how to drive around motorcyclists… it’s worth letting friends, family and neighbours know about this one. UPDATE! Since I originally wrote this post it’s come to my attention Young Car Driver are running a competition to win a SatNav. If you want to be in with a chance of winning one, here’s the link. Of course, you won’t be going anywhere if you’re pride and joy gets nicked. It’s always heartbreaking to see some scumbag has nicked a scooter – they are so much more than simply vehicles. Sadly, There are 20,000 scooters stolen a year, 80% of which are from the owners home. If you’ve had your scoot nick, get it listed on the LCGB National Stolen Scooter Registry, sharpish. Of course the best scenario is not get your scooter nicked in the first place. Simply parking next to a more desirable scooter won’t cut it, the scumbags will probably have both your scooters in the back of the transit! 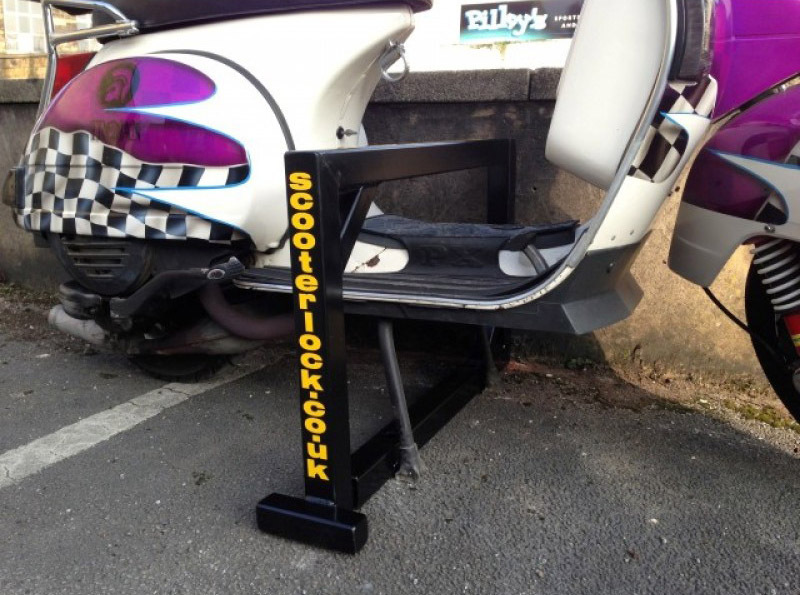 The guys at SCOOTERLOCK.co.uk specialise in Lambretta and Vespa scooter locks, and scooter security products. A worthwhile precaution, in my ever so humble opinion. This entry was posted in Kit, News and tagged Emergency, Locks, products, safety, Scooterlock, Security by crocodilejock. Bookmark the permalink.